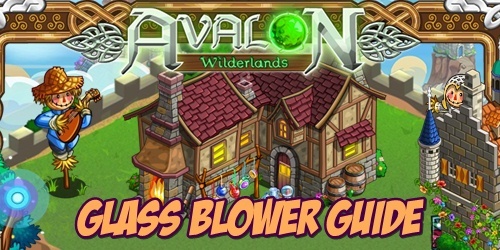 FarmVille Glass Blower is a new crafting building that can be found in a new farm expansion called Avalon Wilderlands. This will be the exclusive crafting building for the Avalon farm and can be used once the Avalon is opened. Initially it will have a total of 20 recipes. It can be mastered by crafting it. Here on this page, you can find these recipes including the bushels that it will going to use plus crafting time. Cone Beaker = Scarlet Pimpernal Bushel x3, Tansy Bushel x3 and Purple Queen Bean Bushel x3. Gilded Pitcher = Borage Bushel x3, Purple Queen Bean Bushel x3 and Wild Leek Bushel x3. Ornate Decanter = English Lavender Bushel x3, Fluer De Lis Bushel x3 and Wild Leek Bushel x3. Bejeweled Glass Tankard = Love Lies Bleeding Bushel x3, Loquat Bushel x3 and Royal Mandrake Bushel x2. Glass Hair Pin = Royal Mandrake Bushel x3, Love Lies Bleeding Bushel x3 and Fair Maid Bushel x2. Emerald Ewer = Fair Maid Bushel x2, French Petite Plum Bushel x2 and Royal Mandrake Bushel x3. Iridescent Ornament = Love Lies Bleeding Bushel x2, Fair Maid Bushel x3 and French Petite Plum x2. Blue Blossom Goblet = Scarlet Pimpernal Bushel x3, Tansy Bushel x3 and Wild Leek Bushel x3. Wedding Flute Set = French Fingerling Potato Bushel x2, Fleur De Lis Bushel x2 and Wild Leek Bushel. Cruet Set = Good King Henry Bushel x3, French Fingerling Potato Bushel x3 and Fluer De Lis Bushel x3. Glass and Gold Vase = Good King Henry Bushel x3, Golden Beet Bushel x3 and French Fingerling Potato Bushel x3. Gilded Hour Glass = Purple Passion Bushel x3, Good King Henry Bushel x3 and Golden Beet Bushel x3. Fruit Bowl = Ornamental Cabbage Bushel x3, Purple Passion Bushel x3 and Golden Beet Bushel x3. Palm Cup = Purple Passion Bushel x3, Ornamental Cabbage Bushel x3 and Blood Root Bushel x3. Perfume Bottle = Blood Root Bushel x3, Borage Bushel x3 and Ornamental Cabbage Bushel x3. Glass Bead Earring = Laurel Berry Bushel x3, Blood Root Bushel x3 and Borage Bushel x3. Glass Bead Necklace = Laurel Berry Bushel x3, English Lavender Bushel x3 and Borage Bushel x3. Dragon Glass Pendant = Ilex Berry Bushel x2, Laurel Berry Bushel x3 and English Lavender Bushel x3. Glass Butterfly = Black Velvet Petunia Bushel x2, Ilex Berry Bushel x2 and English Lavender Bushel x3. Hallway Lantern = Loquat Bushel x3, Black Velvet Petunia Bushel x3 and Ilex Berry Bushel x3.